Fayetteville, NC Stork Rentals! Congratulations to this special big brother on his promotion! Welcome home baby boy! 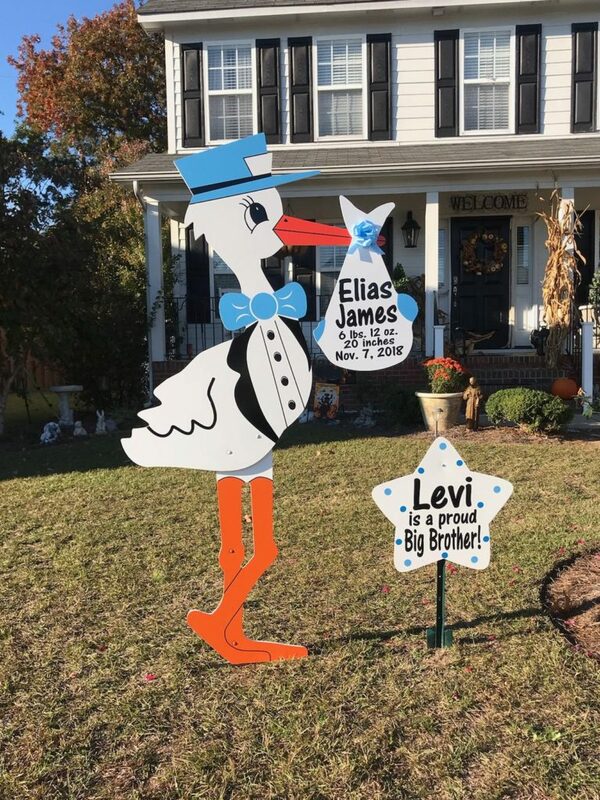 Sandhills Baby and Birthday Signs proudly delivers birthday yard signs and stork signs for newborn babies throughout Fayetteville, Hope Mills, Sanford, Southern Pines, Apex, Pittsboro, Sanford, Holly Springs, Cameron, Carthage and nearby towns. Call us at 910-723-4784. We have a large variety of birth announcement signs to suit everyone’s style, including a selection of classic stork signs, a modern sleek baby carriage sign, sailboat sign and more. We also have a variety of birthday cupcake signs to choose from as well as flamingo yard signs. Visit us on FB, IG, or Pinterest to see more photos of our sign rentals in Fayetteville, NC and surrounding areas!